While Luxe Box by Loose Button had been one of the first monthly beauty sample box subscriptions that had been available to Canadians, this monthly box has now been converted to a QUARTERLY "seasonal" box! This was definitely NOT expected. Yes, a seasonal type of box may have been guessed but not a total transfer over from monthly to quarterly. 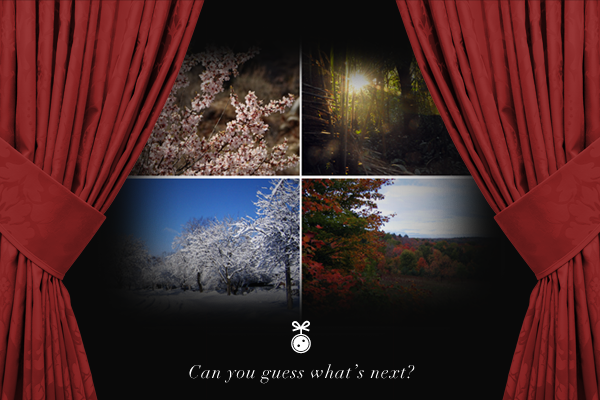 The expectation may have been closer to having both in conjunction with one another, sort of like how Julep has their monthly Julep Maven Box subscription, but also offers the option to purchase Julep Mystery Box when they are occasionally available. In the case of Luxe Box though, Loose Button just sprang this announcement on subscribers today where you really have no choice, it's either you're on board or cancel. The only option that is available if you wish to stay is either to upgrade now by June 13 or upgrade later and get one last box in June. There has been some changes made, which mainly involves how often the Luxe Box is delivered (quarterly instead of monthly) and the subscription price has definitely changed as well. This is in comparison to the $10-$12/month (depends on the subscription length) Luxe Box that we are currently receiving where we have normally been getting at least 4-5 items in each box. With this new Luxe Box, even though we are getting one box every 3 months, in each of these boxes we are only receiving 7-8 products. Value wise, the monthlies are definitely a better deal where we are getting more for less. The only thing we can hope for now is that since Loose Button has more time to get their products together, perhaps the products included in these quarterly boxes will be better in some way, whether it be in size, brand or product itself. If you upgrade to the new quarterly Luxe Box by June 13 (or if you do nothing Loose Button automatically upgrades you), the May 2012 Luxe Box was the last monthly Luxe Box you will be receiving. 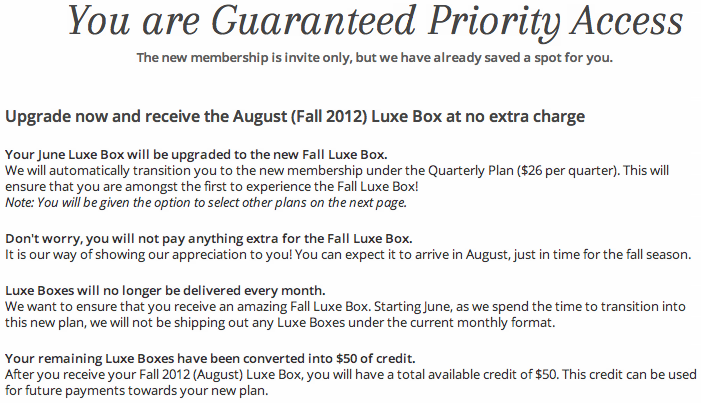 As a sign of appreciation though, Loose Button will send the FIRST quarterly Luxe Box (Fall Luxe Box), for NO CHARGE. After that box, you will need to either pay for or use your converted remaining Luxe Box credits to make payments under the new Quarterly Plan ($24-$26/quarter), depending on which plan you choose. 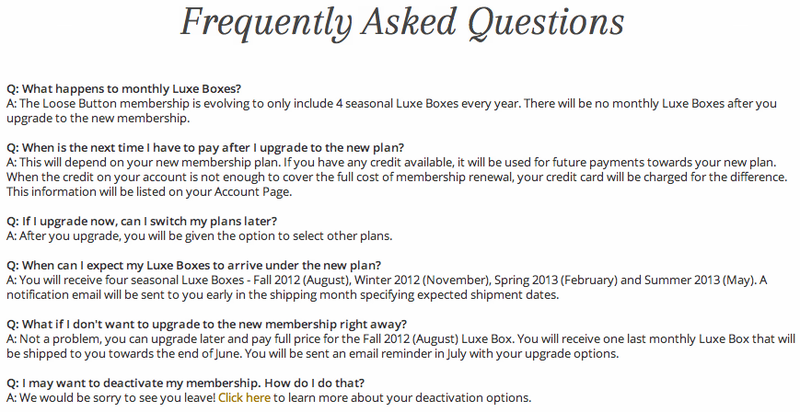 If you choose not to upgrade right away, you can delay it and receive one last monthly box (June 2012 Luxe Box). By doing this, you will NOT be able to receive the FIRST quarterly Luxe Box (Fall Luxe Box) for free. After receiving the June box, you could choose to either pay for or use any remaining Luxe Box credits towards payment of the new quarterly Luxe Box subscriptions ($24-$26/quarter), depending on which plan you choose. 1) Pause and leave the remainder of your balance in the account without losing your member status. In this case, this balance can be used as credit towards paying for a new membership in the future. To give you an example of how the credits are calculated, you can take a look at mine. As you can see, while I still have 5 monthly boxes left, this has now been converted to approximately 2 quarterly boxes (3 if you count the free Fall box). UPDATE: I figured the referral program might be of some interest to some subscribers. Not too sure how the previous monthly referral program will transfer over to the new quarterly plans. If you still receive the complimentary Luxe Box no matter which program it's in, than that's great since the quarterly Luxe Box is a more expensive box to be receiving. 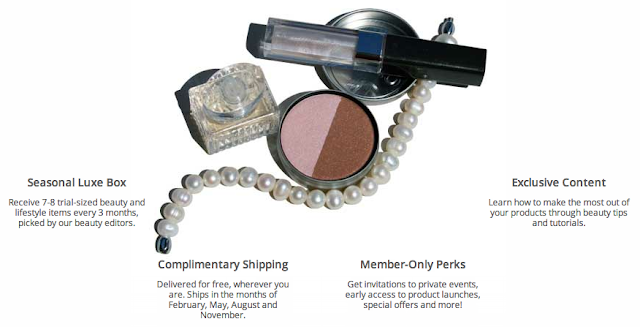 Though if Loose Button tries to make it equate to one another, like 2-3 old monthly complimentary Luxe Box referrals = 1 quarterly Luxe Box, than that might be an issue. I wonder why Loose Button decided to convert the monthly box to a quarterly one instead? I wouldn't be surprised if the reason is based on profits. I'm sure just the shipping and packaging for these Luxe Boxes add up to quite a bit. As well, by cutting down the number of times they have to ship out, they don't have to think of how to make things different and better every single month. Another advantage for them is that by making this change, the quantity of complaints go down as well since there's less boxes to complain about (if complaints are applicable). For myself, I've been debating whether or not to upgrade now or later. I really want the June 2012 Luxe Box since it is the LAST monthly ever. Maybe it'll be awesome since it is the last one. Or, more realistically it will probably just be okay since it seems like Loose Button is trying to get people off the monthly anyway. They are probably going to save the good stuff for the inaugural first quarterly box so that it starts off with a bang. Although I want the June Luxe Box, i'm going to give it up because just by comparing the 2 options, you can see that if you upgrade now, you get a no charge quarterly box ($26 value) while by upgrading later, you only get to save on the monthly box ($12 value) and end up having to pay for the quarterly box anyways. Unless you have only 1 remaining Luxe Box left or if you really choose to not try out at least one of the quarterly boxes, the free quarterly box seems like the better deal. I'll miss the original monthly Luxe Box. While they did have their issues, at least Loose Button did try to make changes and be a bit unique with their First in Line program and and occasional Bath and Body boxes. Here's hoping that Loose Button's evolution of the monthly Luxe Box is for the better instead of the worst. 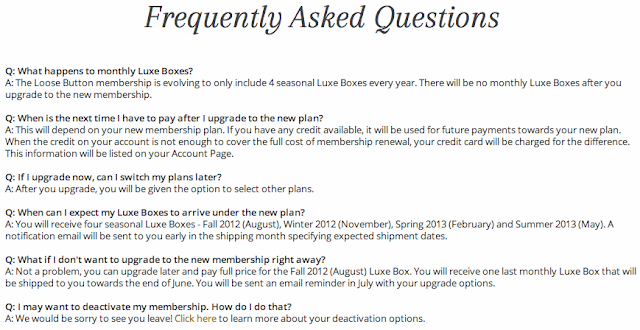 If you are interested in Luxe Box by Loose Button, it seems that their membership has changed as well, where they are making "exclusive" one of their selling points. Whereas before you could have just signed up and pay for your subscription cost (maybe be put on a waitlist), you will now have to request an invitation to even get access to their membership. Seriously, a bit too much change happening a little too fast for me. 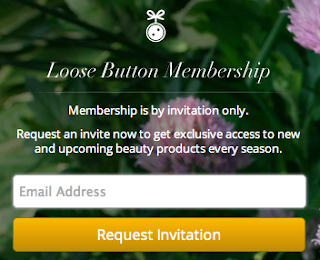 Click on the image below if you wish to request an invitation from Loose Button.